If you're extending a house in 2019, whether you're planning a single or double storey extension, an orangery, conservatory or glass extension, you'll need to know that you're shopping for the very best extension essentials – we're talking bi-fold doors, roof windows, flooring, the lot. So, we've put together a comprehensive list of everything you might need to complete your extension project successfully and for the right price. In addition to helping you weigh up all the options available, our checklist guides you in the right direction with expert advice. For more, our ultimate guide to extending a house has all the planning, design and costing advice you need. When extending a house, one of the first decisions to make is construction type. From oak and timber frames to frameless glass boxes, vaulted ceilings and cantilevered extensions, this first section talks you through extension construction types, ultimately ensuring you choose the right one for your property and budget. Oak frame extensions make a standout addition to any property – either as a single or double storey, orangery or sunroom – but they're particularly suited to period homes, adding more value to this style of house than any other extension construction type. This is due, in part, to their recognised longevity and energy efficiency. While old construction methods are used to achieve a surprisingly versatile selection of desired finishes, it's the use of modern technology that ensures today's oak frame extensions meet the standards set for efficiency. Read our feature on planning (and completing) an oak frame extension for a greater insight. A (generally) less expensive alternative to oak framed extensions, timber frames demand less labour, are quick and easy to assemble and make watertight, and demonstrate good levels of thermal performance. In addition to all of this, they're environmentally friendly, with a large variety of designs to choose from. Sounds great, right? The only instance in which a timber frame extension is not a suitable option, however, is if you're working below ground level. Find out more about how to add a timber-frame extension in our specialist guide. As well as flooding a space with light and increasing a property's value (if done right), a frameless glass extension makes a stylish and contemporary addition to a home. While they're more expensive than many other extension types – budgeting for a minimum of £3,000 per m2 is recommended – they're a standout feature that's particularly perfect if your home offers stunning views. Designing a frameless glass extension will require specialist design detailing to achieve the desired effect. It's also important to think about the positioning of your house, as a south-facing glass extension could become too warm. Find out how to get the perfect glass extension. Cantilevering is a stylish way to add balconies, mezzanines or even additional storeys to a project, connecting spaces and appearing to have no visible means of support. Opting for a cantilevered extension will require the expertise of an architect and we couldn't recommend Adam Knibb Architects more. if you're looking to create a striking extension that's more in-keeping with a period property, has a barn-inspired feel or makes a unique addition to a contemporary home, it may be worth considering a vaulted ceiling. While oak and timber options with stunning exposed beams tend to be the most popular solution when it comes to planning an extension with a vaulted ceiling, it can be equally effective to opt for a finished that's skimmed or exposes steel ties for a more polished and contemporary look. Either way, vaulted ceilings create a the feeling of a larger space that's often flooded with light on account of a glazed end or the addition of skylights. If you like the idea of a vaulted ceiling, contact the specialists at Oakwrights or Carpenter Oak (if you're looking for an oak-framed solution) or POW Architects. Next, it's important to think about the external finish of your extension. Are you looking to use reclaimed brick or stone cladding for a more authentic finish that suits your period property? Or will a contemporary timber or metal cladding better suit the style of your home? Either way, you'll likely need to work alongside an architect or architectural technologist who will help you make the best choice for your extension. Render more you preference? Read our guide to rendering walls to find out more. When choosing bricks, you'll want to think about the colour of your brick and mortar, as well as the colour, size and texture of your brick and the type of bond you opt for. While in isolation all these factors may seem to have a small impact, in combination they'll have a significant effect on the aesthetics of the brickwork. Let's face it, bricks aren't exactly something that you can change easily further down the line. When making a decision you'll want to think about how suitable each kind of brick is for your area, as well as they overall style you're looking to achieve. That said, the age and style of your home could be more effective in determining the kind of brick that will suit your extension. While it's not the cheapest option available, sourcing reclaimed bricks is a great choice if you're keen to design an extension with an authentic-looking finish. While this would be the ideal route for many, also note that sourcing consistent reclaimed bricks in large quantities can be a challenge, so consider opting for a mixture of reclaimed and non-reclaimed if you're planning a large extension. Also be aware of the fact that reclaimed bricks may not have been finished to the same standard as newly produced bricks. As well as trying local reclamation companies, start your search for reclaimed bricks at the companies below. Use our guide to repairing brickwork to find out how to improve the quality of a brick wall you're thinking of replacing. Find out how to create a feature brick wall in the interior of your extension, too. A popular choice for cladding, in part due to its versatility, timber offers the potential for a variety of stylish finishes. Dependent on your taste, shingles, traditional-style weatherboarding for a New England-inspired finish or something more unique are certainly achievable. Another benefit of timber cladding is its affordability, with softwoods ranging from £10 per square metre up to £50 per square metre for more durable hardwood options. It's advisable to treat wood if you're keen to lessen the effects of the weather – namely, fading – and improve the thermal properties. Weigh up your options when it comes to cladding with our ultimate guide to exterior render and cladding. If you do decide to opt for timber, we'd recommend working with Oakwrights or Vastern Timber. If you like the idea of wood, but not the idea of maintaining wood, wood-effect cladding could be the option for you. These fibre-cement boards are designed to look like real or painted wood, meaning you won't sacrifice the finished effect you desire, and are just about maintenance- and rot-free. You can expect to pay a little more than you would for softwood cladding – somewhere around £65 per square metre – though this cost will be offset in the long-run by the lack of regular maintenance required. Start your search at Cedral and James Hardie. If you're extending a period property and want your addition to remain in keeping with your home – either because of personal preference or planning requirements – you may wish to opt for stone cladding. Stone can either be used as a self-supporting, ground-bearing skin or in the form of skin slips – slim pieces of stone attached to a metal base using render to give the appearance of an authentic stone finish. While this is a more expensive option, it's worth the investment if you're determined for your home and extension to flow cohesively. If you've decided stone cladding is for you, we recommend Norstone. Synonymous with contemporary builds and extensions, metal cladding adds a distinctly modern and often industrial feel to an extension, though its use is not as common as you might expect, mostly due to cost. If you're set on using metal cladding, you're likely to need the advice and assistance of an architect who can help you navigate design-related problems – and the best metal to choose. Options for metal cladding include aluminium, zinc, stainless steel, Corten (a pre-weathered steel) and copper, with a variety of finishes available to achieve a specific desired effect. Try Kloeckener Metal for specialist, case-specific advice. Brick slips may be the best option if you're looking to design an extension on a budget with a more traditional finish that's in keeping with your property. Thin and lightweight – somewhere between 20-25mm deep – these slices of brick are easily fixed to a backing panel using adhesive. To create the desired, realistic finish, mortar is then inserted into the gaps to achieve the pointed look. You can expect to pay from £50 per square metre, depending on whether you opt for reclaimed or handmade finishes. Travis Perkins are a one-stop-shop for building materials, including brick slips. If you would prefer either a more contemporary smooth, textured or patterned finish for your home's exterior, it may be worth considering render. In addition to providing a desirable aesthetic finish, like cladding, render can also be effective in improving your home's insulation. Plus it can be combined with cladding for a contemporary finish. While render can be applied to both old and new properties, you'll need to think carefully about whether the type of render you opt for will suit the age of your property. A lime render is better suited to older properties or an authentic look; silicone-based renders, with breathable, flexible and low-maintenance properties, tend to look more contemporary so will better suit a modern home. There are many render types – find out more about choosing the right render in this guide. If you're considering render, factor a total of just under £60 per square metre into your overall budget. While it's possible to render walls on a DIY basis – our beginners guide to rendering talks you through step-by-step – it may be worth seeking out expert assistance or advice if you're not confident about completing the work yourself. Go to Sto, Knauf, Marmorit, Weber for monocouche renders; try K-Rend (K-Lime) and Baumit for lime-based monocouche renders. Sto, Marmorit, Weber, Baumit, Dryvit, Wetherby, Permarock and K Rend are all companies that supply insulation/render systems. Bi-fold doors, sliding doors and steel frame window and door units are popular additions to an extension, coming top of many an extension wish-list. Whether you're looking for a stylish and contemporary aluminium finish, or something a little more traditional like timber, this next section talks you through the window and door options available, as well as specialist glazing solutions, window treatments and recommended retailers. Visually striking, with long-term profitability, thanks to the overall value it adds to a property, specialist glazing is a popular option for homeowners looking for a contemporary extension. It is important, however, if you opt for glazing in any capacity, to think about the practicalities of your design. For example, if you're planning a south-facing glazed extension, be aware of the impact that direct sunlight will have on your space – it could become too hot during the summer months without specialist glazing. Specialist glazing aims to solve such design dilemmas, offering everything from solar control coatings, which reduce solar glare – and with it the cost of cooling a glazed space; to anti-reflective finishes, which reduce surface reflection; and LED glass, which allows you to illuminate panels in a colour or print of your choosing – perfect if you're planning on using your glazed extension as a space to entertain. Decided that specialist glazing might be for you? Check out IQ Glass for expert advice and glazing solutions. An investment that many consider worth making if you're opting for a glazed extension, heated glass not only prevents the build up of condensation, but also eliminates cold draughts and effectively heats a space without the need for radiators. Designed with a specialist glass coating, heated glass creates a warming source of heat when an electric current is passed through. The versatility of this material means it can be used to successfully create a range of finishes; whether you're opting for a frameless structure or incorporating glass into a framework. We've mentioned them before and we'll mention them again, IQ Glass are the people to contact for all things specialist glazing (that includes heated glass). Offering up to 40 per cent more light than traditional windows, rooflights are perfect for flooding a space with light and, in turn, creating that bright and spacious feel that many of us crave in an extension. There are a range of options available dependent on your needs, as well as the style of your property. These include fixed flat rooflights that are low maintenance and non-opening; electronically controlled rooflights; lantern rooflights constructed from timber or powder-coated steel; and conservation rooflights, which are best suited to period properties. Find out which style of rooflight might suit your extension in our guide to choosing rooflights. In terms of getting work started, we'd recommend looking into Velux, Roofglaze, Glazing Vision, The Rooflight Company and Cantifix as companies to work alongside. Clerestory windows are another option worth considering if you're prioritising an extension filled with light. This high level glazing creates a longer, diffused light within a space while preventing the feeling of being overlooked. Particularly popular in new contemporary extensions, clerestory windows can be used either to emphasise steeply pitched roofs or create the illusion of a floating roof. Try IQ Glass for contemporary frameless clerestory windows; Sunflex is an option for aluminium-framed windows. A popular option, aluminium bi-fold doors add a distinct, contemporary feel to an extension, while flooding it with natural light. As well as its aesthetic appeal, aluminium has the added benefits of being durable, easy to care for and strong enough to allow minimal frame dimensions. That said, it is a more expensive option than wood, with a £480 per square metre budget a guide price. Like the idea of aluminium, but wondering if there are any alternatives? Take a look at our guide to choosing the right bi-fold or sliding doors for your home. If you're extending a period property or have more traditional interiors taste, bi-fold doors made of an engineered hardwood timber are an option worth considering. This said, it is important to be aware that timber will require regular maintenance – repainting or staining – to prevent twisting and warping, and because of the width of timber frames – although slimmer ones are starting to come on to the market – won't let in as much natural light as narrower, aluminium alternatives. If you like the idea of a timber finish without the hassle of maintenance, you may consider composites as an alternative. A timber frame clad in powder-coated aluminium on the outside to ensure weatherproofing, with a natural wood finish inside means you won't compromise on style or durability. Apeer is a good place to find good quality composite bi-fold doors, as are Kloeber and ID Systems. If you're designing an extension that prioritises a view, sliding doors are an option worth considering, as a lack of framing promises uninterrupted vistas. While most sliding doors don't offer a 100 per cent opening, they can provide half, two-thirds or three-quarters openings which will work perfectly in a larger space. If you like the idea of sliding doors, but want a completely interrupted view, it may be worth considering sliding pocket doors, instead. While you will have to compromise a little when it comes to the amount of solid wall within your space, a pocket does promise 100 per cent, uninterrupted views. Try Glideline for external pocket doors. Eclisse make great internal sliding doors, too. 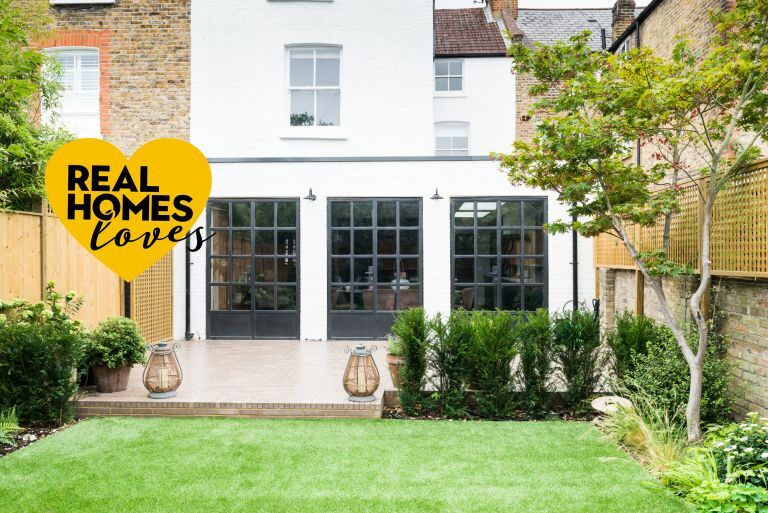 Stylish options that are equally suited to a period property as a contemporary home, metal windows and doors are a firm favourite among renovators. Sleek frames ensure plenty of light floods a space, all while adding an industrial edge that complements almost any scheme. With a variety of colours and finishes available, there are a multitude of options on offer. Take a look at our specialist guide for tips on choosing the best metal doors and windows for your home. In terms of reputable companies, you can't go wrong with Crittall, Velfac and Alpine Aluminium. If you're designing your dream extension, it's worth considering what kind of internal doors will work most effectively. This may mean choosing something that's in keeping with the rest of your home or alternatively a little more special to connect your old space with the new. If you're struggling to know where to start, our buyers guide to internal doors has lots of handy tips, tricks and advise to ensure you choose the best option. We'd also recommend Premdor, JB Kind, Jeld-Wen and Urban Front as companies to work with. In addition to offering privacy and protection against the elements (no-one wants their extension to feel like a greenhouse), window treatments can also act as an additional safety measure, discouraging criminal opportunists from having a browse of whatever your home has to offer – we've all seen that Crimewatch advert. Venetian blinds are a popular option as, when drawn, they offer minimal light and design disturbance. The versatility of Venetian blinds also makes them a suitable option for many varieties of extension. Interested? Browse our buyers guide to Venetian blinds for tips on choosing the right style for your extension. If you're looking to dress French, bi-fold or sliding doors there are a variety of options available. From roller blinds to Roman blinds, temperature controlling thermal blinds and motorised options for tall spaces, find inspiration with our practical and pretty door treatments. If your extension has a glazed roof or glazed roof windows, you'll also want to check out our buyer's guide to blinds for roof windows. California Shutters – for DIY design and fit shutters at a budget price. When extending your home you'll need to think practically about lighting and electrics. From telling you how to prep effectively for the addition of a new extension to planning lighting and putting safety measures in place, this next section ensures you've thought of everything when it comes to the electrical and lighting requirements of an extension. When it comes to choosing lighting for your extension, you have three main types to aim to include: ambient, accent and feature lighting. Ambient lighting generally serves as the main source of light within a space and is responsible for how warm a room feels, as well as its depth. How much natural light your space gets should play a big part in helping you determine what kind and how many sources of ambient lighting your extension requires. If you have a large, light and spacious-feeling extension, you may need fewer light fittings or spotlights. A darker space, however, may require more spotlights to make it a warmer, more liveable space. Accent and feature lighting (see below) are both about creating a practical lighting scheme (think directed kitchen spotlights over prep surfaces) and one that's good looking (we're talking a feature pendant over a dining table, for example). If you're planning lighting specifically for a kitchen extension, our specialist guide on how to plan kitchen lighting will be invaluable. We've got a similarly useful advice in our guide to planning living room lighting, too. Once you've sourced all the information you need, we'd recommend trying Wickes, B&Q or Lighting Direct for the basics. Perfect for poorly lit areas, the purpose of task lighting is to illuminate low-light spaces where specific tasks are performed – clue is in the name, right? This includes lighting under cabinets to illuminate worktops, in cupboards and set into the kick board. Thinking about how (and at what time of day) you'll be using a space is the key to successful task lighting. Our kitchen lighting ideas provide plenty of practical examples. We love the versatility and smart-capabilities of the Philips Hue Strip Lights; perfect for lighting under cabinets. For good-looking task lighting, try Holloways of Ludlow, Christopher Wray, Pooky and John Lewis. In addition to illuminating your space, lighting can also be used to make a striking focal point within an extension. Positioned above a kitchen island tends to be a go-to option for feature lighting, drawing the eye and adding dramatic interest to a space. Feature lighting also functions as a handy design tool in an open-plan space, creating subtle zones without compromising the open and spacious feel. Browse our pick of the best kitchen lighting for options that might work in your space. Or try Pooky, Habitat, Broughtons Lightingor Swoon Editions for gorgeous feature lighting. Opting to extend your home means rethinking fire safety plans and procedures, which is especially important if you're planning a kitchen extension. Developing technologies have meant a significant improvement in the state of fire detection equipment and a move from smoke detectors over to heat detectors in some kitchens (check with your local council's building control, a heat detector may be a requirement in your kitchen extension). Usually mains-wired, heat detectors recognise and respond to significant changes in the temperature of a space, meaning they're less likely to go off if you've burnt your toast, but will detect a fire quickly. Best heat detectors include Kidde HD135F Fyrnetics Hardwireand BRK Brands HD6135FB Hardwire Heat Alarm with battery back-up. For a smoke detector only, we like the Nest Protect 2nd Generation Smoke and CO Detector, which allows you to monitor your home from afar and can be synced with other products in the range. You might also want to consider updating your home security system during the process of extending – this is particularly recommended if you're opting for a glazed extension. While having a good old-fashioned burglar alarm is a good start, with or without police monitoring, you can also keep your eye on your home via smart doorbells and cameras. We'd recommend you start by browsing our specialist feature, do you really need smart home security cameras? to find out why you might want to protect your home from intruders. Our guide to the best home security systems to protect your home talks you through the best options on the market, taking into account different needs and budgets. Start with ADT and Yale for whole house systems; for indoors, we like the Amazon Blink (see our review) and also the Canary all-in-one Security System. Complete with a sleek design and high-quality camera, this piece of kit wouldn't look out of place positioned throughout the house. If it detects anything out of the ordinary, expect to be notified via a handy app. Similar to lighting and electrics, you'll need to think about how you plan on heating and insulating your extension and whether the system you currently have in place is equipped for taking on a larger home. Covering everything from radiators and underfloor heating to insulation guaranteed to save energy (and money) in the long term, find everything you need to know about heating and insulating an extension in this section. We've got plenty of source recommendations, too. Extending your home may require you to replace an existing boiler, investing in an option better suited to heating a larger space. This will not be the case for all extensions, particularly those on the smaller side, but if you're installing vast amounts of water-fed underfloor heating or adding a large extension that includes a kitchen and utility room, this is likely. Rather than seeing a new boiler as an additional expense, consider it an opportunity to make the most of up-to-date technologies and an investment in efficiency. We want to help you choose the best boiler for your home, so we've put together an essential guide to boilers. Happy reading. If you decide you will need a new boiler, we'd recommend contacting experts at Worcester Bosch, Vaillant, Warmflow, Fuller Heating, Nibe and Windhanger UK. Protect your extension from the elements (and sky high heating bills) by investing in good quality insulation. The insulation system used will usually be chosen by your builder and the type specified will generally be dictated by the extension's construction type. You can find out more about insulation types on the government's website. And while this is an expensive part of your build, a minimum of insulation is required by building regulations – and bear in mind that they will ensure savings are made annually on fuel bills. Find more tips on how to insulate your home in our handy guide. If you're looking for a reputable insulation supplier, we'd recommend Baumit, Dryvit, Greentherm Solutions Ltd, Sto, Permarock and Kingspan. When it comes to choosing underfloor heating there are two main options available: warm water underfloor heating or electric underfloor heating. Warm water systems are made up of 1.6cm pipes buried into the floor screed and finished with a covering of your choice. The most energy efficient system available, those with warm-water systems also benefit from low running costs and the ability to control heating in zones. Warm-water systems should be considered early on in the extension planning process. If you're keen to avoid raising floor levels, for whatever reason, or simply wish to heat a single room with low installation costs, it may be worth considering electric underfloor heating instead. This simply involves linking the system to an existing electrical system and controlling it via a thermostat. In addition to being suited to retro-fitting (meaning it can be added at a later date if you don't have budget for underfloor heating at this stage) electric systems are also considered more affordable to install. That said, their running costs are greater than those of a water system. There's a lot to know when it comes to choosing an underfloor heating system, luckily our complete guide to in-floor heating explains everything. If you're opting to heat your extension with radiators, as is often the case, you're about to find out that there are many more options available that you might have previously realised. The first thing to consider is fuel type; are you looking for a solution that's plumbed in? Or might an electric radiator be a better solution for your space? Once that's decided, you'll want to think about design. Are you fixed on the idea of an original, cast iron radiator? Or might a modern, yet equally striking, replica – complete with all the 21st century functions – better fulfil your requirements? If you're looking for something a little more contemporary, you'll be spoilt for choice with designs available in aluminium and stainless steel and a variety of different shapes; horizontal, vertical and column to name but a few. You'll want to choose a radiator with the best design, model and fuel type for your space and our comprehensive guide is a great starting point. After that, check out The Radiator Company, Screwfix, Soak and Bisque for a variety of designs and heating solutions. Major DIY stores and plumbers' merchants are a good option for those on a budget, too. The perfect addition to a stylish extension, stoves create the warm and cosy feel that so many of us crave during the winter. While wood-burning traditional burners are particularly popular options, you'll need to ensure you buy one that's approved by Defra. There is also a vast selection of gorgeous contemporary multi-fuel options on offer, too, if your interiors taste is more modern, or if you want a (mostly) maintenance-free stove. Want more tips on how to choose a stove? We've got plenty over in our guide. Our pick of the best woodburning and multi-fuel stoves? They're right here. Brands we love? Charnwood, ACR Heat Products, Morsø, Hunterstoves, Stovax and Percy Doughty. Sound insulation for your extension won't be essential for everyone, but is an option worth considering if you're extending a tightly packed terraced house or are planning on using your new found space as a cinema room, studio or space to regularly entertain guests. Acoustic panelling is installed in between the two outer walls, so it's imperative that you make a decision about it during the early planning stages. We'd recommend working with Soundstop or Sonata Acoustics to achieve your desired finish. An element of extension planning that wouldn't have existed 10 years ago, smart home and audio visual systems are now more popular than ever and can make daily life easier and more practical than you might have imagined. From implementing the best smart home system into your new extension, to planning sound systems and choosing the best TV for your space, this section of our extension essentials guide covers everything you'll need to bring your home into the 21st century. If you're planning a modern extension, chances are you'll want to equip it with modern technology. Enter smart home systems. With the capacity to connect everything from your television to your thermostat, smart home systems are designed to make life easier and more efficient. They can be controlled from your phone, tablet or with the sound of your voice, allowing you to maintain control of your home from near or far. What's not to love? With the world of smart home tech expanding on a daily basis (that's no exaggeration) there's a myriad of smart home solutions available, depending on your requirements. Our favourite brands include Nest for heating and security; Hive for heating and lighting; Philips for smart lighting. Amazon Echo-enabled devicesand Google Home enabled devices are also worth investigating as part of your smart home suite. Find a CEDIA professional for help with installing home technology. Whether you're still into traditional television and have big love for the BBC or have made the switch to online players such as Netflix or Amazon, a TV is still an essential in most households. If you're intending on having an extension with a snug or living area, you may be considering investing in a new model that suits the space and makes the most of up-to-date technology. With so much choice on the market – OLEDs, LCDs and smart TVs – it can be tricky figuring out which model is right for you. Luckily we've put together a series of handy guides to help you choose the best TV. In terms of where to buy a TV, you really can't go wrong with the guarantee offered by John Lewis & Partners. Designed to increase the size of a home and often complete with an airy, open plan layout, extensions tend to make the perfect space to host and entertain guests. With this in mind, you may wish to consider investing in a second-to-none sound system; something that will enhance your experience of watching a film or perfectly project music throughout your space during a party. The Sonos Playbase 5.1 Home Cinema System, with its sleek and compact design, is designed with quality in mind and promises to provide deep, clear Hi-Fi sound. Read more about it (along with our thoughts on other equally magical systems) in our guides to the best surround sound speakers and home theatre speakers, too. When planning an extension, it's important not to overlook the importance of flooring. Serving both a practical purpose and altering the aesthetic feel of a space, flooring is integral to achieving your desired finish. Whether you think you like the idea of wood, stone, concrete, porcelain or really don't have a clue, we'll talk you through the pros and cons of each of your options; providing plenty of design inspiration, practical advice and recommended retailers who'll get you one step closer to your dream extension. If you're wondering how to choose the best wood flooring for your extension, you've come to the right place. Providing the perfect canvas for an array of interior trends and styles, wood is not only stylish, but also easy to clean and maintain. Hardwoods are a great option for busy homes that see a lot of footfall, as they're much more durable and hardwearing than softwoods. Oak, maple and cherry are great choices with guaranteed longevity, though they can be more expensive. Alternatively, a soft wood, such as pine, is more budget friendly, though it will require more maintenance. Either way, solid woods are an authentic option that will enhance the value and appeal of your space. Alternatively, choose the best engineered wood flooring you can afford for a long-term flooring solution that has the appearance of wood without the required maintenance. While engineered wood comes with a slightly heftier price tag, this is usually offset by an attractive manufacturers guarantee – anywhere from 10 years to a lifetime. Laid side-by-side, you'd barely notice the difference between real and engineered wood. Check out Kersaint Cobb, The Natural Wood Floor Co, Carpetright, The Natural Wood Flooring Company, Indigenous, Kahrs and Devon Devon for gorgeous flooring solutions. Stone flooring is a great option if you're seeking timeless, durable design and is especially attractive if you're planning a kitchen extension, open-plan or otherwise. Ranging anywhere from £30 per m² for slate, granite, limestone, travertine and other more affordable stones, up to £500 per m² for more high-end solutions such as marble, stone flooring suits a variety of budgets and has the added benefit of increasing property value. What makes the difference, when it comes to stone flooring, is its finish. While flamed, polished and pillowed finishes will achieve a sleek and glossy look, you may wish to opt for brushed, honed or tumbled finish if you're looking for something a little more natural or rustic. Like the idea of stone flooring? Browse our guide to choosing real stone flooring for all the info, advice and inspiration you could ever need. Seriously. Water-resistant, hardwearing, easy to clean and compatible with underfloor heating, ceramic and porcelain tiles are a budget-friendly flooring solution (expect to pay from as little as £30 per m²) suitable for extensions, as well as throughout the rest of the home. Potential wear should be the deciding factor when choosing between ceramic and porcelain; softer and more porous ceramic is better suited to spaces exposed to less traffic, while porcelain can withstand much more rigorous daily use. Whatever tile choice you make, watch out for its PEI (Porcelain Enamel Institute) rating, as this determines suitability for use. The closer the rating is to five, the harder-wearing and more appropriate for heavy traffic areas. Choosing flooring for a contemporary extension? Concrete and resin are on-trend, practical solutions perfect for a home with a distinctly modern or industrial-inspired feel. Ideal if you're planning an open-plan extension, poured concrete ensures a feeling of continuity while still allowing for successful zoning within your space. Relatively similar price wise (expect to pay upwards of £100 per m²) the main difference between concrete and resin is the finish. Concrete tends to have a more natural appearance and is available in a variety of finishes depending on your taste; smooth and polished or rugged, brushed and raked. More tips on choosing concrete and resin flooring (as well as plenty of inspiring homes that have used them) over in our guide to choosing the best resin or concrete flooring. In terms of reputable companies to achieve you dream concrete floor with? It's got to be Grey Matter Concrete. For resin, go to Senso. While making decisions about the structural aspects of an extension is undeniably important, decorating also plays a large part in achieving your desired finish and is the stage of a project that many people look forward to the most. If you're unsure about whether you should be painting or papering; opting for light and bright white scheme or moody interiors, we're pointing you in the right direction with our gorgeous design ideas and expert buying guides. If you're extending, it's likely that you'll need to choose paint at some point during the decoration process. There's more to this process than simply choosing a shade you like however, as you'll need to choose a paint that suits the function of your space. In a kitchen extension, for example, you'll need to opt for something that stands up to rigorous use and is perhaps even stain or water resistant and wipeable. Our top choice is the Dulux Easycare Kitchen Matt Emulsion Paint, which is easy to apply and dries to a practical, wipe-clean finish. Want to consider a few more options? Check out out pick of the best paint for kitchens. If you're not intending on using your extension as a kitchen, there's less need for such a specialist paint formula – a paint brand like Dulux or Crown are both go-to, reputable brands. Other brands to try include Valspar and, of course, the perennially fashionable Farrow & Ball and Little Greene, although these paints are more expensive than the DIY stalwarts. As for colour, if you're not sure where to start, we're here to help with a specialist guide focusing on how to choose the perfect paint colours for every room in your home. Wallpaper is another easy and popular option that can help you achieve your desired finish. From rustic looking brick-effect wallpapers to bold prints perfect for a feature wall, you're guaranteed to find something that suits. Kitchen extensions make up a large percentage of extension and renovation projects, with many homeowners looking to design spacious, open plan solutions perfect for family living and entertaining guests. Planning a kitchen extension? If so, you'll likely be thinking about what kind of kitchen you'd like and how it will work as part of the overall design of your space. We'd recommend establishing a clear image of your dream kitchen before consulting professionals about the practicalities of your design and working to find solutions. While aesthetics are important to many of us, it's essential that you don't overlook the functionality of the space; how you will use it on a daily basis and whether it will suit your taste for years to come. We've written a step-by-step guide on how to design a kitchen to ensure you get the process right from start to finish. Top of many a 'most wanted' list, kitchen islands are a dreamy addition that many people prioritise when renovating a kitchen; whether as part of an extension or otherwise. Providing the perfect link between kitchen living room and in an open-plan extension, kitchen islands not only create a striking design feature, but also provide handy preparation and storage space if designed correctly. For a truly gorgeous kitchen, try deVOL, Herringbone Kitchens, The Callerton Kitchen Company, John Lewis of Hungerford, John Lewis, Plain English, Magnet, Martin Moore, Burlanes, Mowlem & Co, Neptune and Harvey Jones. Wondering about the best bar stools, too? Pull up a chair and browse our pick of the best. When many people hear kitchen, they think expensive, but that simply doesn't have to be the case, as proven by our easy ways to design a stylish kitchen on a budget. While fitting a kitchen is never going to be the cheapest home renovation you take on, it's not ridiculous to expect to achieve a gorgeous result for less than £5000, especially if you're prepared to shop around and complete some of the work yourself. For a budget-friendly kitchen, we love Ikea (especially if you opt for custom finish fronts from Plykea). Also try Howdens and British Standard, the sister company of Plain English. Working a bathroom into an extension is a smart move if you're adding an additional bedroom into your extension and like the idea of an en-suite, or would benefit from a downstairs toilet. From stylish bathroom design ideas to our pick of the best recommended retailers and bathroom fitters, this section cover everything you need when designing a bathroom as part of an extension project. Are you intending on working a bathroom into your extension as part of an en-suite? Or do you think your home would better benefit from the addition of a practical downstairs loo? Either way, you'll want to think about where your bathroom is going to sit within your extension during the early stages of planning. How you intend on using an additional bathroom should be at the forefront of your planning, but you will also have to consider how much space you realistically have to play with. If you're looking for a luxurious master en-suite where you can enjoy evenings winding down, it makes sense to prioritise a larger amount of space for your bathroom so that it can accommodate a large, roll top tub, for example. Or, perhaps you just need an extra toilet or shower room to suit the needs of a larger family. If you're unsure where to get started when it comes to how to design a bathroom, our handy guide is a great place to go. We've covered how to design a small bathroom, too, if that's better suited to your extension. Once you've browsed our handy guides, you'll want to start thinking about reputable brands and bathroom fitters who can help you achieve your desired outcome. We'd recommend working with DIY stores and Victorian Plumbing (if you're on a budget); Albion Bath Company and Barber Wilsons & Co for traditional fittings; CP Hart and Bath Store for contemporary fittings. One of the final stages of planning an extension is thinking about furniture. When you've reached this point, you know you're on the home straight and can look forward to enjoying your new found space. We've focused on big-ticket purchases in this section – namely sofas and dining furniture – to ensure you get the most for your money. Whether you're looking for an on-trend velvet sofa or traditional Chesterfield; a table for two or something extendable so you can host the whole family. If a dining room or kitchen-diner will form part of your extension, you may wish to think about how dining furnishings will impact the finish of your space, not only in terms of design, but also in terms of how you use the space. Are you planning on hosting the coming Christmases or regularly dinner parties, for example. Whether you're opting for traditional wooden dining furniture, a sleek and contemporary set-up or something more unique, our buyers guides make the process of choosing dining furniture easier; talking you through the best options for your space and taste. Our go-to stores when it comes to dining furniture? Swoon Editions, John Lewis & Partners, Furniture Village, Graham & Green, Next and Maison du Monde. Looking for tips on how to choose a sofa, so you can curl up and enjoy your new extension? We thought as much. With everything from classic Chesterfields to gorgeous and on-trend velvet numbers, it can be difficult to know where to start. We'd recommend you begin with comfort, after all, this is a space you want to feel relaxed (and there really is nothing worse than an uncomfortable sofa). After that, we'd recommend thinking about design. Do you want something timeless and traditional to suit a period property? Or something with a more contemporary design or in a bold colour that will make a striking and effective focal point? Either way, our gorgeous buying guides talk you through the best options. Looking for reputable retailers? We love Made, John Lewis & Partners, Loaf, Willow & Hall and Swoon Editions (we're pretty confident you will, too). Looking for more extension advice and inspiration?